In our preview of the Watford game, we asked Liverpool to find their mojo again. Ninety minutes, five goals and a clean sheet later, it would be fair to conclude that they did exactly that. Quite how Jurgen Klopp oversaw such a turnaround from the languid display last time out at Old Trafford is anybody’s guess, but the manager certainly earned his corn in the preparations for the clash with the Hornets. Maybe he showed his players some of the negative press that had been written about them, because there was a certain wounded pride in his comments after the game. “You know what was written and said about us. It is of course not right,” he said afterwards. With Bobby Firmino injured, Klopp sprung a surprise by naming Divock Origi on the left flank and shuffling Sadio Mane inside, and it has to be said it worked a treat. Mane played like a man possessed, causing the Watford defenders untold headaches with his direct running. And Origi, well, he looked like the talented youngster who had the world at his feet barely two years ago. It was also notable that Gini Wijnaldum played much higher up the pitch, creating a stronger link between the midfield and attack that was noticeable in how much more dangerous we looked in the final third. And as for Virgil van Dijk’s brace of goals….the first was Liverpool’s seventeenth strike from a set piece this season; more than any other Premier League side. That just goes to show we’ve added a bit of beast to our beauty this term! All of which sets us up rather nicely for Sunday’s Merseyside derby at Goodison Park. Our record there is good, and while the Toffees will up their game, naturally, for such an important tie, we at least have all the ingredients to bag the local bragging rights. We were rather worried when Firmino was ruled out of the Watford game through injury, but thankfully Origi and Mane, between them, ensured the Brazilian wasn’t missed. That creates something of a predicament for Klopp: does he bring Bobby straight back in, or does he reward his re-jigged frontline with another start? You would assume that a game of this magnitude would see Firmino brought back in to the eleven, but you just never know. 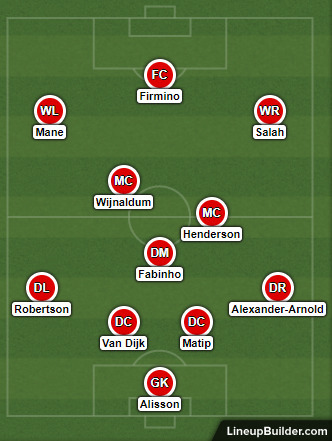 Elsewhere, the hope is that Trent Alexandr-Arnold and Andy Robertson got through the Watford game with no exacerbation of their injuries, and with Dejan Lovren still out the hope is that messrs Van Dijk and Matip are also in good health. Jordan Henderson only played 20 minutes against the Hornets, and he will surely be fit enough to start in midfield; probably alongside Fabinho. Hopefully, Wijnaldum will be given the freedom of Stanley Park to roam forward and act as the link man to the front three once again. The 3-0 win over Cardiff City last time out came as a blessed relief for Everton, who had previously lost three on the spin. Remarkably, the Toffees haven’t drawn a league game since December; they’ve won four and lost eight since. Their home record this term (W6 D3 L5), with a goal difference of zero, is so-so at best, and perhaps their most telling statistic is their record against the ‘big six’ teams: W0 D1 L6. If this was any ordinary game of football, you would snap the bookmakers’ hands off when they offered you odds of 16/25 about a Liverpool victory. But as we know, there is a ‘local derby’ tariff to be built into the price, and that’s why the bookies have been so generous with their odds-making. That said, we haven’t lost since October 2010 to our Merseyside rivals, winning five of the last seven. So maybe we shouldn’t get too hung up on the whole local derby angle. And so our first bet is in a market that has delivered the goods for us on numerous occasions this season: Liverpool to Win to Nil, which is available at odds of 9/5. That is a princely price for a wager that has landed on 14/28 occasions this term, with a side that has kept three consecutive clean sheets. Another market that has been profitable in 2018/19 is Sadio Mane to score anytime. The Senegalese ace bagged a brace on Wednesday, and there’s a small chance he could play as the central striker once more. If he does, those anytime goalscorer odds of 8/5 will vanish!